Tata Motors had released a statement that the new Bolt and Zest won’t be made available in the taxi market, however as per a new image we have received it says something else. The Tata Bolt will now even be sold in the taxi market to Ola at least. This could mean that the company might not continue selling its new products only in the private car sector. The Bolt’s design is a combination of the best ideas from three of Tata Motors’s design studios in Pune (India), Coventry (UK), and Turin (Italy). The company believes that they have created a new benchmark in the industry with the introduction of the new hatchback. The Bolt is also a part of Tata’s HorizonNext strategy, with three aspects of DriveNext, DesignNext and ConnectNext, where each aspect stands for excitement, looks and connect respectively. The Bolt’s new design language and attractive features are bound to attract the youth in India. Though the silhouette might give an impression that the Bolt is similar to the Indica, the design philosophy is completely new. The fascia sports a new grille, revised headlamps with projectors, fog lamps and a revamped bumper. On the sides, the window lines swoop down in a curve towards the rear hatch which is now devoid of the Christmas tree lamps. However, what the rear does get are rounded edges and certain styling cues from slightly more premium cars. The Zest looks a little odd due to the compact sedan philosophy but the Bolt looks like a much more complete product. The new tail lights, high and low mount stop lamps, and a chrome grille are some of the features seen at the back of the vehicle. The same eye-brow lifting experience is what we got after stepping into the Bolt. There is the obvious resemblances with the cabin of the Zest, because it is nearly identical. But, differences in the choice of interior colour theme and the upholstery have actually made a difference to the Bolt’s cabin making it seem more plush and well-finished. The black colour theme and the unpretentious dashboard layout combine together well in creating an impression of European appeal. It is also a welcome departure from the not so plush biege interior themes of previous Tata models. The cabin features pretty much the same features as the Zest – the centre stack with the Harman infotainment system and touchscreen, a similar instrument cluster with the rpm-needle that turns red when it crosses the redline, the same neatly chrome-lined aircon vents and the 360mm steering wheel with controls. Variations to the materials used are there, but the parts and the layout have been shared with the Zest. Yet, in the Bolt, the cabin seems better integrated and less ‘plasticky’. The Tata Bolt is powered by the now ubiquitous 1.3-litre Fiat sourced MultiJet diesel engine, badged as QuadraJet and is offered sans a variable geometry turbocharger. With the fixed geometry turbo, the Bolt diesel outputs 75 PS at 4000 RPM and 190 Nm between 1750-3000 RPM. This engine offers very good performance and under Tata’s own tuning, power delivery is linear and turbolag is well out of sight. Like the petrol, the diesel Bolt too is paired to a 5-speed manual gearbox and an AMT version isn’t in immediate sight. The petrol mill powering the Bolt is identical to the one seen on the Zest but has been tweaked with peak torque offered in a wider band. It’s the only turbo-petrol motor in the segment and the 1.2-litre unit outputs a class leading 90 PS and 140 Nm. While a layman might find it hard to differentiate between the three modes, they do make a difference and the same can be felt even on part throttle. We tested the Zest with a VBOX and saw different timings in different modes so the multi-drive mode is no gimmick, it works. Performance is the best in Sport mode and shifting on the fly is a boon as you can get additional punch in an instant when you need it. The car does pull to triple digit speeds with little effort but progress is slow post 130 km/hr. By default the car is in City mode and there is no button to select City. The clutch is light and the gearbox is smooth but there are vibes on the lever when you accelerate hard and leave the pedal completely. When driven in Eco, one can easily get good mileage numbers to the tune of 13-15 km/l. The Bolt uses a conventional suspension setup with independent struts at the front and a torsion beam and springs at the rear and is tuned to be slightly stiffer than the Zest’s setup. What isn’t conventional though is the way it muscles its way over bumps. The new dual-path dampers, new subframe and recalibrated struts silently iron out the rough bits, round off sharper bumps and do a splendid job at keeping the occupants isolated from the road. Sure, the hatchback pitches and bobs a bit at speed but overall, the suspension feels almost perfect for our road conditions and this makes the Bolt one of the best riding cars in its class. 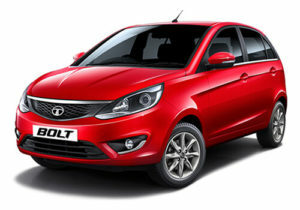 Tata Motors has given the Bolt front airbags, ABS, EBD and Corner Stability Control. Unlike its rivals from Japan and Korea, the Bolt isn’t a light car and the heavy weight does make its presence felt as you simply don’t feel like your driving a hatchback, the vehicle feels robust. Yet to be tested by NCAP, we expect the Bolt to fare very well but safety equipment on lower trims would be a nice touch. Tata Motors is doing a lot to improve the service experience for its customers and the same is reflecting already although such things take time. After spending a day behind the wheel of the Bolt, we can say that the Bolt lives up to the standards set by the Zest. It looks decent, is spacious and rides pretty well too. In fact, Tata Motors has been smart in changing the suspension setup as well as the steering feel, thanks to which it is a lot more fun to drive and will appeal to a slightly larger audience. Will it beat the competition? Well, a lot of it will also depend on the pricing, but one thing’s for sure, Tata Motors has once again got it right with the Bolt.